You can’t beat the low cost and easy installation of a laminate floor. It’s a great do-it-yourself project that can really transform a room. Here are some tips from the pros to help you get the best results. 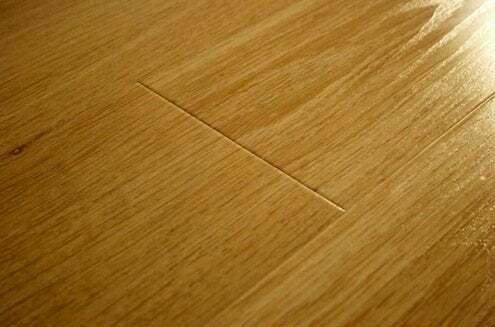 Installing laminate over a bumpy subfloor can compromise it. Make it worth your effort by running a straight edge all along the floor before you start to check for dips or high spots. You can grind down seams in the plywood with a coarse-grit sandpaper on a belt sander. Build tips by troweling on some vinyl floor patch and letting it dry. This is the time to check for squeaks and screw them down. Always use the manufacturer’s recommended underlayment and the tape that’s made for it. Lay the sheets crosswise to the direction you lay the flooring, and only lay a couple of sheets at a time so you don’t rip the underlayment while you work. For big jobs, you might want to buy or rent a laminate sheerer. These make quick and quiet work of cutting the boards to length without even getting off your knees.